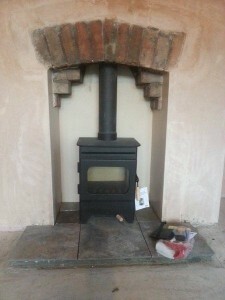 Stove in recess with offset flue. Tiled hearth. Your fireplace and hearth should, at this stage, be fully ready to accept your stove (which fits perfectly because you chose the stove AFTER finding out the size of your recess). If you have not already created a large enough recess or fireplace for your stove with a suitable hearth then you need to go to the navigation panel on the left and choose a suitable topic. Please make sure you also fully read “Before you start” and “Fireplace opening” sections thoroughly. Chimney liner uncoiled and ready? Before we go any further: you are here because you are adding your stove into a fireplace and the chimney is being lined with a chimney liner. Your hearth is now finished. 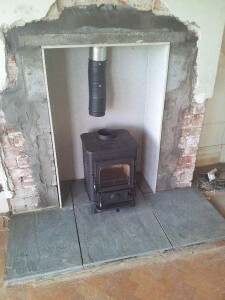 Your builder’s opening the correct width for your stove and looking good. 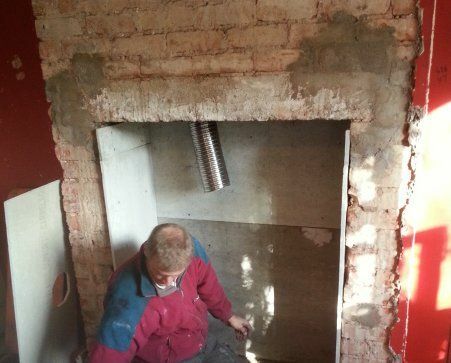 Your lintel or arch is in and the correct height for your stove and method of fitting. Your chimney liner is in and dangling. All you need now is to seal the chimney (using a closure plate) and fit the stove to the chimney liner (and add Vermiculite to the chimney if required). 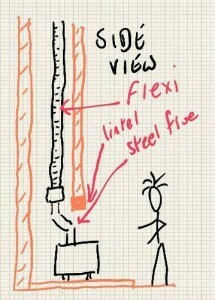 Lets’s look at some of my scribblings – examples of the two most common methods of fitting your stove. 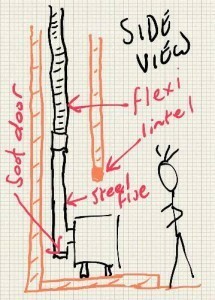 The above two scribbles show the most common methods I use when fitting stoves. 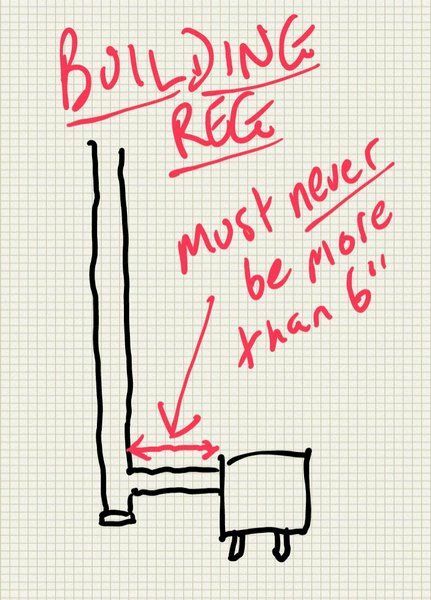 The top picture is the most simple and is possible as long as your builder’s opening is deep enough to allow sufficient air gap behind the stove (required gap will be stated by stove manufacturer but if wall is non-combustible then usually 2.5″ is enough). The lower picture of the above two pictures shows two elbows (30 or 45 degree elbows), combined to create a 2-3″ offset, to distance the stove from the back wall to create the required air gap. We’ll come back to this. Note: Some stoves (Ekol 5 and 8 for example) CANNOT be swept through the stove so you will need to have a sweep-door in the pipe between the stove and the closure plate (in an elbow or in a straight section of steel vitreous pipe). This black steel vitreous flue does not have an offset. The pipe is passing through a sealing plate (available from our store). Note the A1-fire-rated Hardiebacker lining board within the recess. 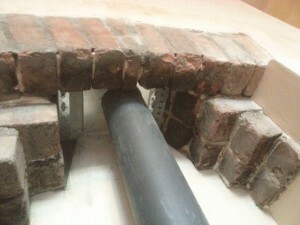 As long as your builder’s opening is made of brick or stone with NO combustible materials (plasterboard is classed as combustible) then there are no Building Regs that stipulate the size that your builder’s opening should be and no regulations that dictate any air gap requirement around that stove once it is in the recess. 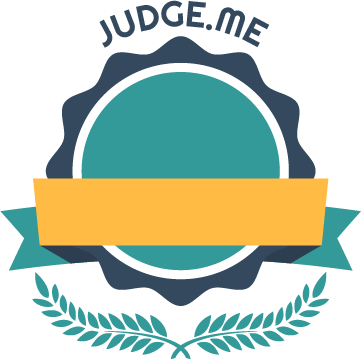 BUT, there will be air gap requirements provided by stove manufacturer’s unique to each stove (usually in the stove’s installation instructions so download these prior to purchasing the stove). Building inspectors may insist on these air gaps conforming to manufacturer’s fitting instructions even if there is no obvious safety reason to adhere to them. 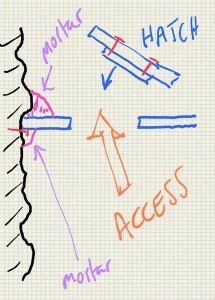 Why the air gap anyway? To protect the fireplace from overheating and to ensure the heat from the stove gets to the room rather than being soaked up by the building (tucked into a small recess the stove output to room may disappoint). What is the height required between then top of the stove collar and the closure plate if two elbows are on top of each other? 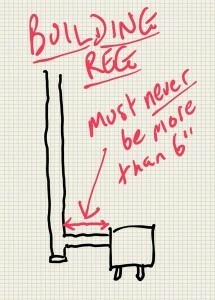 40cm covers this but allow 50cm if one elbow has a soot door. Note that different brands of elbows will have different heights when added together to form an offset. 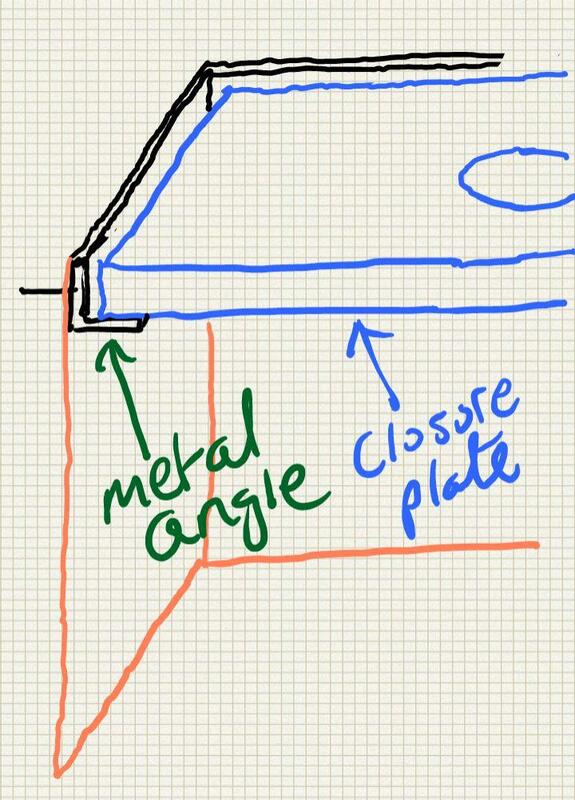 You do not want to be going through your closure plate at an angle as the sealing plate will not work. Or you use a “T”. But only if your recess is good and wide so you can access it to sweep up through the T and access the soot collecting door. A sweep door in the vertical is also desirable. 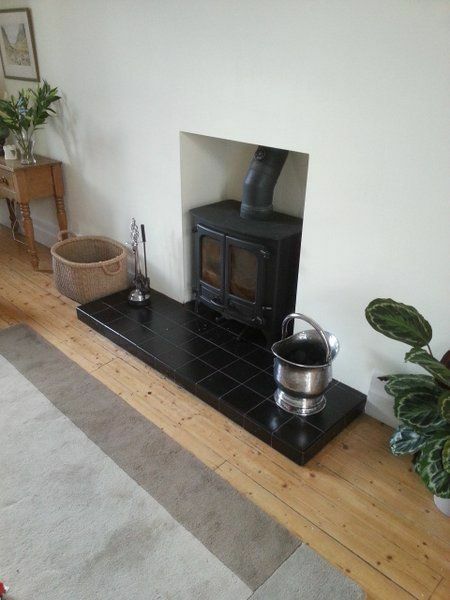 As with the adaptor situation in the above picture the stove may leak smoke from its open door (whilst lighting) until the fire is established and the chimney warmed. Heat rises and does not like travelling horizontally. Flue pipe should not travel horizontally any more than the diameter of the flue pipe used (so max 5″ horizontally for a 5″diameter pipe and 6″ for a 6″ pipe). See also “New Rule 2014” below. New Rule 2014: It is “possible” to travel up to 450mm horizontally off the rear of a stove and fit a 90 degree bend with various caveats. I DO NOT ADVISE THIS. I do not advise this as you are very likely to lose a lot of draft from your chimney. Read more about this here (3rd page). Before we go any further let’s first make sure we understand the difference between a closure plate and a register plate (both seal off the chimney from the room and are the ceiling above your recess). Here is a definition for both . Now, what situation are you in exactly when it comes to your recess? 1. You are following my “smooth-lining” instructions and wish to continue with this method. 2. Your inglenook is unlined (brick/stone/rendered etc.). We will look at these two scenarios seperately but if you are a number 2 (ooer) then I would still read the instructions aimed at the number 1’s as a lot if it is still relevant. You should have something that looks like the picture above (without my colleague in the picture unless he has been moonlighting). The left, right and rear of the recess are lined with cement board and a dangling chimney liner is present. As I have suggested in the smooth-lining section you can, if you wish, fit the closure plate before the liner goes in, and even before the wall-lining (just adapt the instructions as required). Your first job is to cut a piece of concrete board (12mm Hardiebacker) that will slide in on top of the three lining boards already in place, like a slide in shelf. You will cut a hole in the board for the flue to pass through (I think I spy one in the picture ready to go, leaning on the left chimney breast). We will look at the hole in a moment. This top plate is your closure plate. I know that the chimney liner is in the way, I’ll come to this. 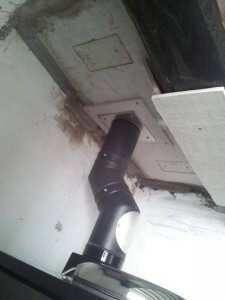 Before the closure plate design commences I usually connect my “adaptor” to the bottom of the chimney liner (adaptors can have differing lengths of nose and have two methods of attaching to the liner – bolts or self tappers). 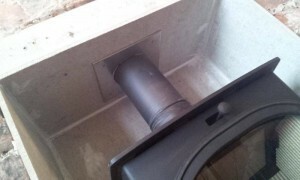 You will likely chop some of the bottom end of the chimney liner off so you have a nice clean end to fit the adaptor to. The chimney liner slips easily into the top of the adaptor (between two surfaces) and the bolts tighten to secure it (or use self tappers). 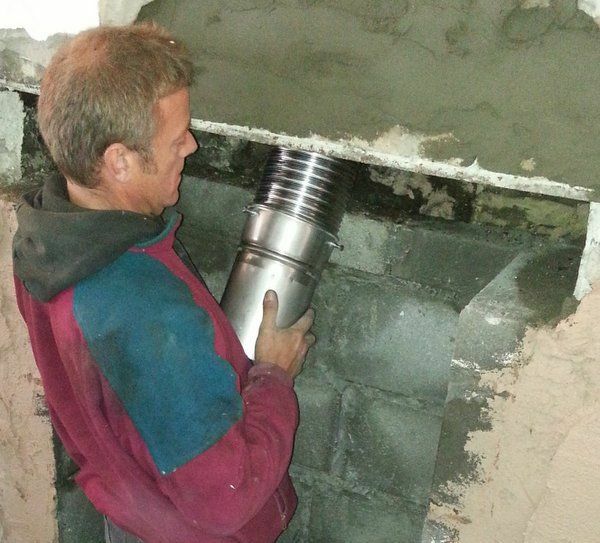 The small gap between the top of the adaptor and the chimney liner – fill this with fire cement. Then you will go to the top of the chimney and pull the chimney liner up until the adaptor is out of the way for the moment above your closure plate. With the closure plate cut measure the width of the board (left to right) and mark a centre line. You can clearly see the centre line and this dictates where your hole will be (left to right). Where your hole will go forward to back will depend on where the rear edge of your lintel is and where your back wall is – it will be somewhere in between the two. The square “sealing plate” shown is the one bit of kit that I fit on every stove installation. It is a square of stainless steel with a simple fireproof gasket. It is available in 5″ or 6″. 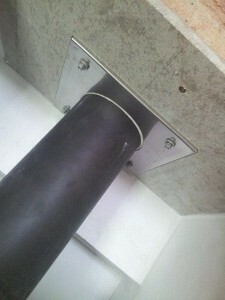 It provides a neat and tidy method of allowing your flue pipe to pass neatly through the closure plate. The one I supply is galvanised, at £20, which can be sprayed black with stove spray paint if required. Many fitters, having not heard of sealing plates or wanting to save a few pounds, just cut a hole in the closure plate. They cut this hole a couple of mm more in diameter than the flue and they later fill the gap with fire cement or fireproof rope. The fire cement or rope almost always falls out at some stage and sometimes the concrete board cracks under the extreme heat of the pipe. Also, if the hole is slightly off-centre (it is not easy to be mm exact) then your stove will be off-centre in the recess (5mm out does not sound enough to worry about but it can be very obvious to a keen-eyed customer should a knob in the centre of their stove not lined up with the centre grout-line of the hearth). The little sealing plate allows last minute stove adjustments left or right, forwards or backwards (of a cm or more) to ensure the stove is central in the recess and the flue pipe is vertical. 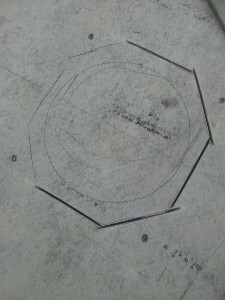 It also protects the concrete board from direct heat. Place your square sealing plate on your new closure plate and put it exactly where you want it to be. You will be bearing in mind that you ideally will need to ensure your long nose adaptor will be a minimum 2-3cm clear of the front or the back wall because the adaptor is a little bulkier than the pipe or liner. If you are not using offset elbows you may want it as close to your lintel as possible but not so close as for the liner or adaptor, or its bolts, to foul against the lintel or wall. Ensure the bolts on your adaptor are not in the way (the adaptor can of course turn on the liner before tightening so the bolts can be sticking out somewhere harmless (there are three bolts). When you cut out your hole you can afford to have it of a reasonable size. As long as it is smaller than the square and there is material left for the four screw holes to work then all is good. I like this picture. It almost shows how to fit a stove all in one picture. You can see the hearth, the lining boards, the lintel and now the adaptor dropping through with two offset elbows connected. If the adaptor drops through a little too much you may not have to worry – chimney liners usually have a bit of spring to them and you will be able to push up with your black pipe. How did I slide the plate in when the adaptor was hanging in the way? Two methods: 1. If there is plenty of room you can slide the plate in until the adaptor/liner is trapped at the back then push it out of the way into the void. Then reach in through and pull it through the hole. If everything is too tight then use option 2. Take the adaptor off. Slide the plate in. Put the adaptor back on through the hole (there is just enough room to get your spanners in if you cut your hole large enough. Larger hole to aid fitting. Note also extra inspection hatches also aid fitting and inspection (only possible on larger closure plates and no good if adding Vermiculite). Note:if you are really struggling here then you can cut a huge great hole in your plate and add another plate over that hole afterwards (the second plate has the cover plate on it (so essentially you are creating a much bigger cover plate out of Hardiebacker concrete board). See the pic “Larger hole to aid fitting”. This is a different kind of job but it is still a closure plate and we needed access to the adaptor at all times during fitting. To avoid confusion “cut edge below bump” means that the installer has cut the female end of the vertical flue pipe and slid it over the male elbow – and this picture shows how neat that can be if done well. Use a grinder with a 1mm thick 115mm diameter metal cutting blade. In the picture above, the chimney liner enters the arena at an angle from the left and so it has been necessary to add an elbow to the bottom of the adaptor. In this situation you will have the bottom of the elbow hanging through the hole in the closure plate and not the snout of the long nose adaptor. Make sure you connect your elbow to your adaptor with a metal to metal self tapper (we do not want the elbow coming off when the sweep comes). I supply these self tappers in the store. 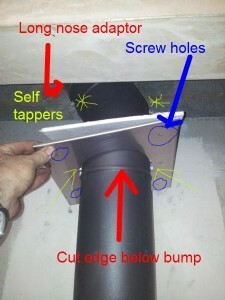 Make sure there is enough elbow hanging through the closure plate hole to get your next self tapper in. Sometimes in this situation I prefer to cut the closure plate in half and fit it in two pieces or, as previously mentioned, create a larger hole and add another square of concrete board, or I fit the closure plate before smooth-lining the recess (see below). Then you can connect the vertical piece of vitreous steel pipe first, as seen in the photo. There is nothing to stop you fitting your closure plate first, before your side and rear boards as can be seen in the scribble on the left. It is a lot easier as the liner/adaptor is never in the way (you lift the plate UP rather than slide it IN). All you need is some thin metal angle and use it to support your closure plate. We did this once on a job when we had to do a very swift closure plate because the hire company wanted the cherry picker back and we did not have enough time to do the rear and side boards but we had enough time to pour our Vermiculite in and get the cowl on. 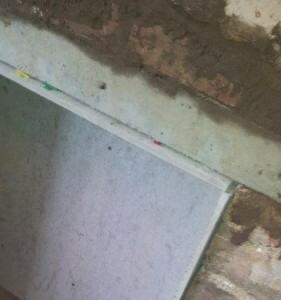 So we fitted a quick closure plate and poured in our Vermiculite. 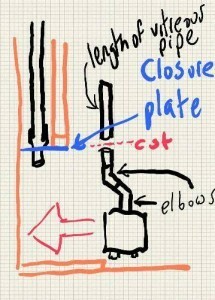 Now you will connect your closure plate to your lintel using a couple of short Thunderbolts to secure upwards. If there is a gap between the top front edge of your closure plate and your lintel then you will have to fill that gap before using Thunderbolts to screw your closure plate to your lintel. If you do not do this the plate will lift at the front and open up a gap above the side-of-recess boards (small gaps can be filled with Decorator’s Caulking). If it’s only a few mm of gap you might choose not to worry about it. If its a cm then you will have to be creative (e.g. 1cm pieces of copper tube as spacers with the Thunderbolts going through the middle). If your closure plate rises up at the back a little you can somehow weight it down (a couple of bricks fed in through the hole) and reach in through the hole and add mortar in strategic places. Note: you should be able to remove your adaptor if its in the way because the hole in the closure plate is large enough to get your spanners in. Remove your stove from it’s packaging and assemble it according to its user manual. Most stoves have a rear exit flue hole and a top exit flue hole. Choose which one you are using and fit the stove’s blanking plate to the other with the parts provided (you will usually seal this with supplied rope or webbing or use fire cement). Fit your stove collar (again you will usually seal this with supplied rope or webbing or use fire cement). You may have to bolt on the stove legs (if you have adjustable legs make sure they are loosened ready to go – they are sometimes bolts in threads and more difficult to sort out when the stove is in the recess). Position your stove on the hearth and plan your steel vitreous flue configuration. This may just be one piece of pipe or it may be more complicated. You can cut steel vitreous flue pipe if required (I always have to as I only keep metre lengths in stock). I use an angle grinder with a very thin metal cutting blade of approx. 1-1.5mm thickness. Make sure you wear long sleeves, eye protection, dust mask and gloves. Please take this very seriously as the thin blades can shatter. YOU CAN ONLY CUT THE FEMALE END OF THE VITREOUS (THE TOP OF EACH PIECE) -IF YOU CUT THE BOTTOM, NARROWER MALE END YOU RENDER THE WHOLE PIECE OF PIPE USELESS. I use masking tape to get a perfect line and then carefully cut all the way round. If you have an offset (two elbows) the piece you are most likely to cut is the small vertical piece on top of the elbows (you might be lucky and find that your elbows are the perfect height anyway. I have always refused to cut gloss stove pipe (expensive and may chip). You can also cut your long nose adaptor snout shorter if required. NOTE: Make sure your long nose adaptor does not slide into an elbow too far and block off half the diameter of the elbiow (slide it into the elbow as a test before you fit to see what I mean). Also make sure your adaptor, if a long nose, does not slide in and seal your soot door – or in a year’s time you’ll get a phone call from an angry sooty fella with a brush. Slide your vertical (or your elbow depending on configuration) onto the long snout of the adaptor then fit all your other vitreous. You will need to slide the sealing plate onto your pipe at this stage. Use at least one metal to metal self tapper to join each pipe joint (I use two, one on each side of each joint. NOTE: Only use very short self tappers as you do not want them protruding far into the flue as they will upset your sweep! Self tappers struggle to pass through the stainless steel of the adaptor so a pilot hole may be required. Super strength pilot drill bits and self tappers available from the store if required. Note: An impact driver is essential for the self tappers if not using a pilot hole. A normal cordless drill is fine otherwise. Now, you may struggle a little here or you may not. Because an inch of your vitreous inserts into your stove collar this means that you have to lift all the vitreous assemby UP a little (to clear the top of the collar). Usually the liner springs up a little to assist – then you drop the male vitreous end into the female collar. This is where the long nose adaptor comes into its own. 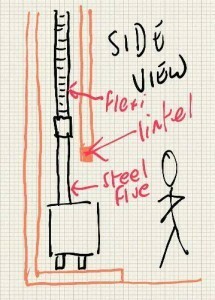 I have had instances where the chimney liner is solid in a tight chimney (usually because the Vermiculite is already in or the liner is a bit stuck) with no spring whatsoever and have unwisely used the cheaper short-nosed adaptor. If this happens you have two possible options: 1. Does it help to take the collar off, slip it onto the vitreous and “slide the stove in underneath it”? You can only do this if the collar sits atop the stove and can be connected from within the stove. If so you need to protect your hearth with two pieces of thin hard plastic or similar whilst you do this. 2. It is possible to scoop the stove in (tip it backwards at 45 degrees and go in that way). Neither way is pleasant. 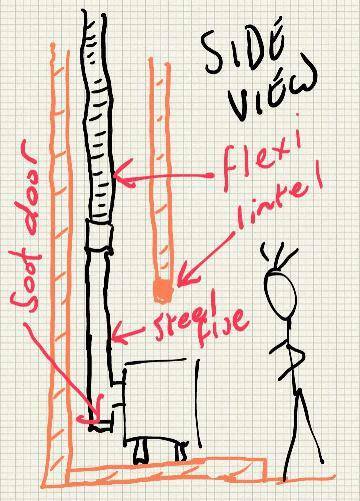 If you have enough room you can also use a length of adjustable flue pipe above or below your elbows (rarely is there enough room for this). Add self tappers where required (I usually add two at each connection, left and right). Although self tappers only poke into the flue a few mm I still like to think of the sweep and locate them accordingly – looking at the flue from the room this is left and right of the pipe. Some fitters use stainless steel pop rivets. Add fire cement to any gaps (no need for between sections of flue pipe), in particular the top side of your adaptor and the stove collar. The stove collar may also need some fire rope pushing into the gap if the gap is more than 3-4mm. Your sealing plate will screw to the closure plate using screws or self tappers of a suitable length. If you have an offset in your flue pipe you now see why having a lintel that is at least 50cm higher than your stove top is a good idea. If the gap is too small then your pipe will be going through your closure plate at a 45 degree angle and this is a very difficult elipse to cut and seal. Make sure any “supposed to be vertical” pipe is vertical left and right and forwards and backwards before fitting the sealing plate (I use a short magnetic spirit level) and that the stove is central in the recess. Did you add fire cement to the gap between your stove collar and top of adaptor gap? Note that we are only sealing the chimney for cosmetic reasons and to prevent any draw by the chimney (you want all the draw going through the stove and not up the chimney and escaping at your cowl). 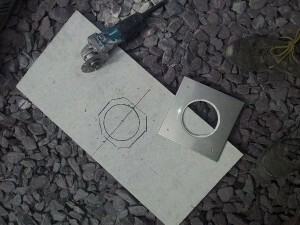 Your closure plate will be made from the same material: Hardiebacker 12mm concrete board. You will use the same sealing plate. The main difference here is that you will not be able to slide your closure plate in on three nice “side/back boards” and so you must find a way of fixing the closure plate in place. 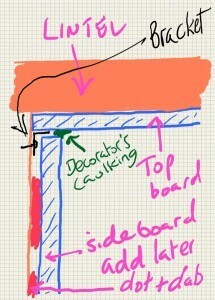 The traditional method is to screw metal right-angle to provide a “shelf”. If your recess is nice and rectangular with smooth walls then this is easier than if the reason is “all over the place” (e.g. stone). If your recess is all over the place then you will probably have to make it up as you go along. One method is to cut the closure plate as close as possible to the shape of the recess (maybe in two or three pieces if it is proving difficult in one). Then wedge or prop it in place and insert strategically placed Thunderbolts as “pegs for the board to sit on. You can hide these pegs by smearing mortar into your corners. If you have room then adding access hatches to the plate means you can add mortar inside the chimney, on top of the plate (or you might be able to reach through your flue hole if you can get the liner out of the way). You might only need a few Thunderbolts to help it stay in place whilst your mortar sets. 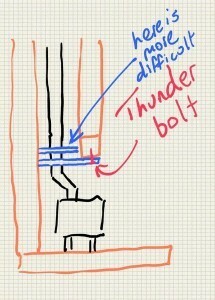 You might find that you can just screw or Thunderbolt your plate straight into your lintel. 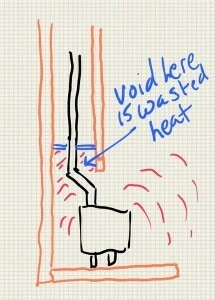 Whenever possible avoid voids that trap heat. You might hit a problem of the “gather showing beneath the lintel”. This can happen if the gather starts low down, especially if you require a slightly higher lintel or arch (maybe to cope with an offset flue pipe as already discussed). In this case you do only have a couple of choices: 1. Leave the gather exposed (and paint the brickwork or leave it natural). 2. Add a lintel lower down and brick in any gap above that lintel (this may not be an option if an offset is required). 3. Shield the gather from view with a piece of Hardiebacker set into the top of the recess (leaving a small air heat trap above the stove). Note that a closure plate is “cosmetic” and does not have to act as a barrier to prevent smoke entering the room (the stove/liner combination is a sealed system with no smoke escaping).